I can’t remember the last time I saw someone fall through the ice. Given that my high school and college years were spent in upstate New York, there’s little doubt that I’ve seen such a thing, but somehow watching this happen again yesterday – several times – transfixed me. 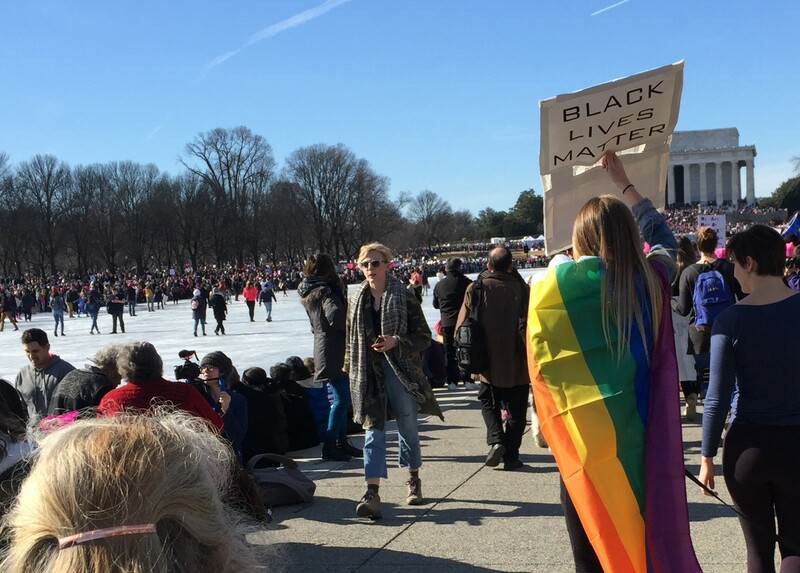 Saturday January 20th was auspicious – Year #2 for the Women’s March in Washington and around the world. So I probably should’ve been paying more attention to the many “big name” speakers up there on the steps of the Lincoln Memorial, in the heart of my city. 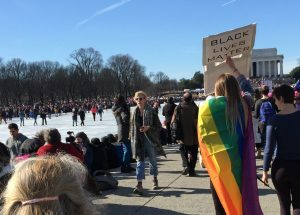 Thousands of people (yes, mostly women) gathered around the Reflecting Pool, which was covered with ice from our long bout of extreme cold weather. Yesterday, however, the sun baked down and the temperatures soared. A few of those gathered chose to wander out onto the ice… and in time, a few of them fell through. Their mishaps were little more than uncomfortably cold brief embarrassments; the water was barely deeper than their knees. Still, it offered an apt metaphor to where my thoughts had wandered. As I mused on their icy exploits, speaker after speaker exhorted us to redouble our resistance, to mobilize in strength for the upcoming midterm elections, to “do politics – or else politics will do you”. I knew they were preaching to the choir – we were there because we’re the committed ones. Still, even our staunch commitment had limits; the speeches were too many, too long, and most of us wandered off after the speeches had droned on for well over an hour past the official march start time. So technically I did not march yesterday, but the afternoon was well spent and reinforcing; at this stage I will take whatever solidarity I can find. Living in Trump’s Washington is dispiriting in the extreme, and the harshly cold winter has only exacerbated the misery – and the alarm. After all, we’re walking on thin ice. Our democracy itself is in peril, as most in Congress prove – yet again – to be ineffectual or inept, unprincipled or simply opportunistic. It’s hard to find a positive narrative as I watch the U.S. Government shut down again, irrefutable evidence that our legislators cannot perform the most fundamental task that they were sent there to do – pass a budget. Living in the Maryland suburbs of Washington, D.C., I know that so many of my neighbors who are hard-working, vastly under-appreciated federal civil servants or foreign service officers will again feel that they’re pawns in a cruel and unnecessary game. Such venerable federal institutions had come to represent the best of American values in the world, but now they’re hemorrhaging people of unmatched international experience and wisdom – people who could not find any way to reconcile their own professionalism and deep commitment both to universal human rights and to the U.S. Constitution with having to serve an administration that embodies no such commitments. The (long but still inadequate list of adjectives warning) venal, narcissistic, boorish, serially dishonest, ill-informed, racist, anti-democratic, and deeply biased Donald Trump and his enablers are leading us as a nation away from urgent global priorities we’d come to recognize before November 2016: climate change, increasingly extreme economic inequalities, rising levels of gender-based violence and intolerance around the world, the decline in democracy in nation after nation, to name but a few. And while Trump and his “America First” agenda callously turns America inward, he finds ample opportunity to afflict himself upon those outside our borders. Consider his reinstatement and expansion of the Global Gag Rule which imposes draconian restrictions to nearly $9 billion in U.S. health assistance, causing great harm and little if any discernible benefit to vulnerable poor women around the world. We’re walking on thin ice. This administration is failing to honor our prior international commitments to protect the human rights of refugees and asylum seekers, stigmatizing (against all prevailing empirical evidence to the contrary) these desperate and vulnerable people as a criminal and terrorism threat, while slashing our contributions to international agencies providing essential humanitarian support to these very people who number well in excess of 65 million (of whom 80% are women and children). Refugees and asylum seekers who are already in the United States, trying earnestly to rebuild their lives, are also now facing new reasons to fear for their and their children’s futures as they see their religions, diverse national heritages, and personal integrity trashed. Our country’s callous treatment of refugees and asylum seekers here and abroad – many of whom face existential threats to their lives and safety in the countries they fled from – is a betrayal of who we are as a nation of immigrants. I’m reminded of this daily in powerful email messages that I receive from beleaguered yet resilient LGBTQI refugees in Kenya’s Kakuma refugee camp. Human dignity, human rights, and even compassion seem sadly absent from the Trump agenda. The inward-focus of this government is pushing us to a place on the ice where our longstanding reputation as a global democratic leader, champion of human dignity, and as a country that cares about the poor and afflicted abroad is no longer supportable. As I watched the ice walkers on the Reflecting Pool, I almost believed I could hear the ice cracking far away as Vice President Pence met this weekend with Egypt’s leader Abdel Fattah el-Sisi. This strongman is one of the Trump administration’s inner circle of favored authoritarian dictators, each with egregious records of human rights abuses. I’m hardly surprised; the fault lines in the ice of global cohesion and peace had already expanded exponentially with Trump’s recent Oval Office characterization of African, Caribbean, and Central American nations and their citizens – a vulgar and appalling assault on their dignity. With all those recent Trump travesties wearing me down, the antics of the ice walkers yesterday were captivating. One could disparage their rationality and risk-taking for venturing out onto the ice, but I’m not in a position to pass judgement. They had their reasons. Still, I stared as the ice warned them time and again, with its sagging under their weight, and the small cracks fusing into ever-larger cracks that raced toward the ice walkers as they (finally, belatedly) tried to make their escape to the concrete surroundings. They were not fast enough, the ice gave way, and down they sunk into the very cold waters below. Certain paths take us to places where the dire outcomes are inevitable – and predictable. The most compelling aspect of their ice drama however was not their splash through the shimmering white surface; it was their struggle to regain their footing. Each time they attempted to climb out, the ice at the edge of the hole collapsed, and they sunk in again. It took multiple tries, and usually the helping hands of others, to regain their safety on a solid, dry surface. How long will it take this great country to realize that the ice is cracking under us? The evidence of a fall from international respect is already abundant; many would say we are well past a time and place where we can avoid that calamity. Some will say we are already wet, well above the ankles, and getting higher. Yet the turbulent and frigid waters churning under the thin ice of global cohesion and collaboration are far more dangerous, and much deeper and darker. A nuclear war with North Korea, irreversible climate change, the inevitable push-back soon to come from the #MeToo movement, the growing and violent global assault against sexual and gender minorities…the cracks are too many to count. Each and every crack in the ice testifies to the global decline in respect for universal human dignity and the architecture of human rights that has been built upon it. We’re urgently in need of solid-footed leadership that is based upon, and stoutly defended by, universal secular moral values. We hunger for principled and virtuous examples of leadership, public service and compassion, and for a compelling vision for global cooperation and peace. It’s not going to happen under Trump’s watch. Let’s pull America from the yawning hole in the ice, starting now and at the ballot boxes in November.